g91 | of rookie struggles and non-clutch bats . 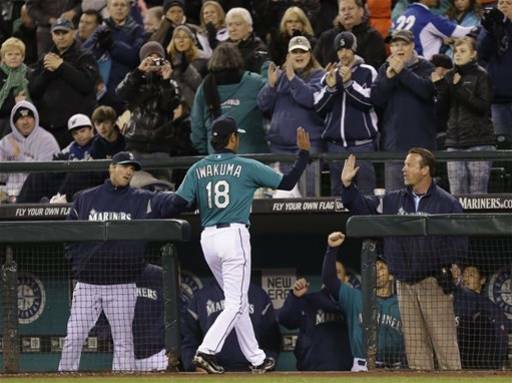 . .
To say it wasn’t Roenis’ night is a bit of an understatement . . . 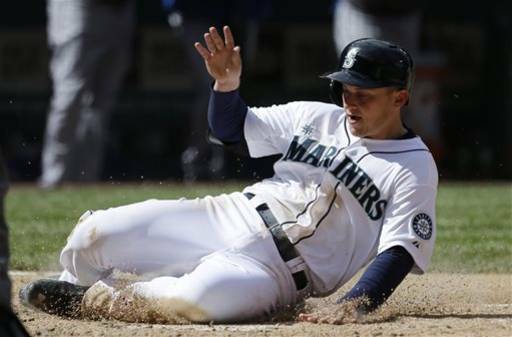 The M’s actually out hit the Twins 12-9 . . . I remember when the Twins were known for their fundamental DEE – not sure if that’s still a general impression but, they sure looked beyond fundamental in the field tonight. Clarifcation on Endy Chavez leading off games: He's 11-for-20 with 2 BBs in first at-bat in 22 starts. So reached base 13 of 22 times. Whoa. Passed ball Zunino. Don't see that every day. Ball gets under Morrison's glove. Was out with 2 coaches taking extra fielding practice before the game. Ouch. Twins up 7-0. That's 9 full innings in relief now for Maurer since he was called back up: No runs, 4 hits, 2 walks and 10 strikeouts. Skip not ready, Stephen DL’d again, Jesus serving 50 . . . According to Jack, via Greg Johns, who speaks with him everyday, he’s progressing well but, won’t join the team just yet when the team returns home . . .
“I don’t think Eric will be with us this week,” Zduriencik said prior to Sunday’s series finale with the Orioles. “I know he has a couple appointments ongoing. He’s got something midweek where he’s going to sit down with doctors. “He’s doing well. I talk to him every day and he sounds normal and he’s excited to get back here. He wants to get back. But when Eric gets back, you want him to be back. 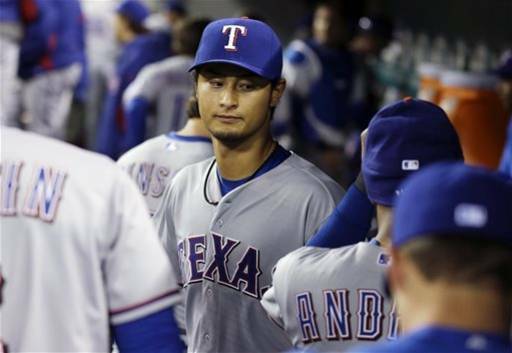 His anxiousness to get back here in the dugout is one thing, but this is a life-long health issue for him. When he gets back managing this club, we want him to be here. You don’t want him to come in here and be here for two or three days. Reliever Stephen Pryor has suffered a significant setback in attempt to return to the Mariners this year from a lat injury. As I reported yesterday, Pryor was to get checked out further by team doctors to see what was causing a “bruising sensation” in the area of his triceps. General manager Jack Zduriencik told us this morning in Baltimore what was found on his MRI was concerning enough to shut him down for the remainder of the year. 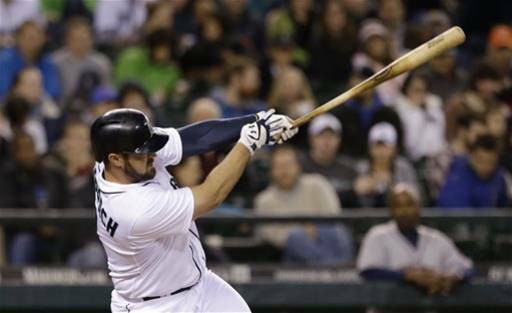 Zduriencik was not sure how or specifically when the injury occurred. He said it is not related to the previous lat injury, however. This is tough news for the team that could use a healthy Pryor in the bullpen but even a bigger blow for Pryor, who has been working hard to come back from the original injury. Disappointing on another level (though we’ve been hearing it would happen for months now) – Jesus’s suspension . . .
Great outing for Brandon, especially considering the competition, which should go a LONG way in building his confidence. Though he had runners on base in FOUR of the SIX full innings he pitched, he was able to either work out of trouble or limit the damage. He also had a nice balance of fly outs to ground outs. Bobby walked the lead off guy and then fielded a sac bunt as that runner advanced but, it wouldn’t matter, as Stephen came to strikeout the next two batters (one on a curve, another on a 98mph fastball) of the 7th. Unfortunately, after getting TWO outs and walking ONE in the 8th, Stephen had to come out due to some sort of injury (UGH!). Ollie came in and battled the first batter he faced (Murphy) who eventually hit a high fly ball that Dustin A L M O S T got to but, it skimmed of the tip of his back-handed glove in shallow center field. Thankfully, after another fairly long battle with the next guy (Soto) Ollie got him to fly out to right field for the third out. Then, the Bartender came in for “closing time” and got a fly out to center field, a strikeout with his signature NASTY curve and then a fly out to right field to earn his FIFTH save and preserve Brandon’s FIRST big league victory! Not to be outdone in the “making up for boo-boos” department, Jesus drove Kyle in (after he’d checked in with his second double) to tie the game at 3 and help atone for his passed ball in the top of the inning. Dustin recorded his first RBI of the season – a single to score Jesus from 2B (yes, really!) 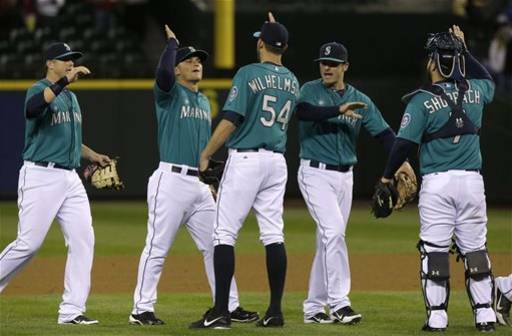 to give the M’s a 4-3 lead that they would not relinquish! Not a real sparkling day in the field – no double plays, but, they did nail a runner at home with one out in the 5th and a runner at 3B, Dustin snared a ground ball and threw home to Jesus to just barely nail the runner. And now, a MUCH needed day off at home . . .
g12 | Happy Birthday, Kuma! Kuma was fabulous tonight ~ getting his 2nd victory on his 32nd birthday! I’ll admit I panicked a bit when Wedge took him out with TWO outs in the 7th after only 90 pitches and the fact that the both the batters that Charlie faced reached base (ONE hit, ONE walk) did not provide me with any warm fuzzies. It wasn’t till the post game show that I was reminded about his “finger issue” – apparently, he’s still dealing with it but, luckily it wasn’t a factor tonight. 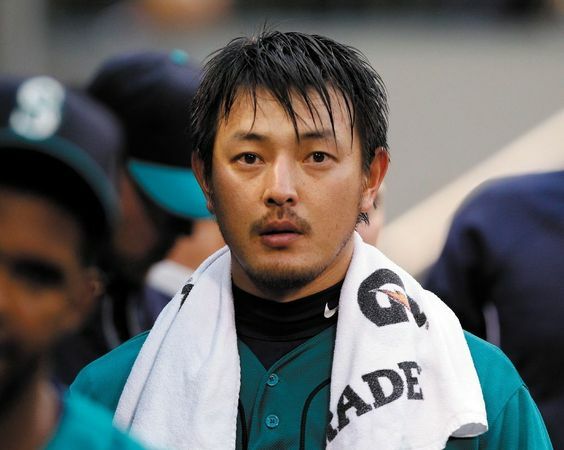 Kuma did give up his first walk of the season – after 18 full innings without one (second longest in M’s history, behind Cliff Lee). Anyhoo, Stephen came in and promptly recorded the 3rd out via a strikeout of the 7th and, despite allowing a couple of singles in the 8th, he escaped unscathed turning the ball over to The Bartender who recorded his FOURTH save. Apparently, playing RF at The Safe is a dangerous proposition lately . 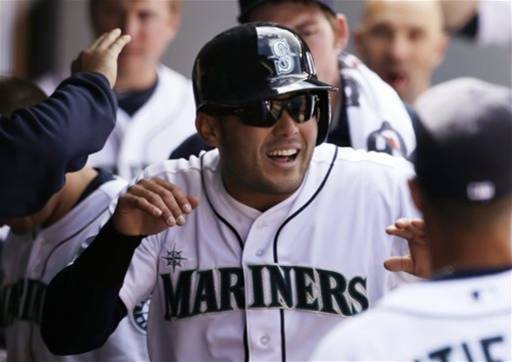 . .
Ian Kinsler ends Iwakuma's perfect game, no-hitter and shutout with one swing, a HR to LF. That one wouldn't have been out last year. g10 | so much for the “lowly” Astros . . . Earlier today, a couple of announcement were made regarding the roster . . .
And the Astros just keep on hitting (including THREE more home runs) . . .
* Bright pitching spot of the evening was Bobby’s major league debut ~ retired all THREE batters he faced: struck out TWO (including Chris Carter who had FIVE hits, including THREE homers, in the series) and got a ground ball out. 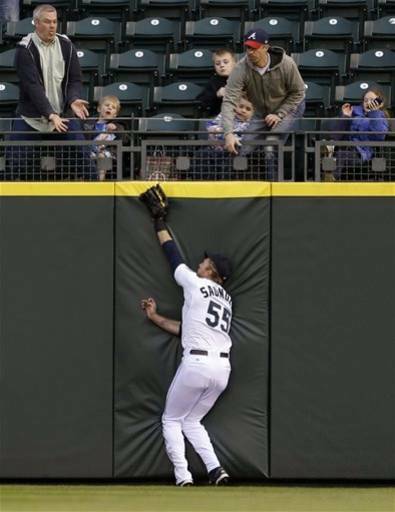 * Scary first play of the game when Michael Saunders made a great catch up against the wall in right field . . .
Pete Carroll in the front row just got the biggest cheer of the night. Tweet of the day . . .
Rivera asked at presser to name toughest batter he ever faced: "(Former Mariners DH) Edgar Martinez. Thank God he retired. Oh my God." g6 | it’s the little things . . .
like being able to lay down a bunt with two on, no out and just getting a clutch hit here and there. Unfortunately, his numbers didn’t improve in that regard today. And, he missed an opportunity at history ~a win would have been the 100th of his career and five more K’s would have equalled 1500~ which would have put him in elite company as only the fourth pitcher (w/Bert Blyleven, Walter Johnson and Dwight Gooden) in MLB history to collect those milestones before his 27th birthday. I’m sure the team loss hurts him more than the loss of the history notation . . .
Felix has a decent shot to reach the milestones a few days after his 27th birthday (which is Monday) at home during a Supreme Court Night (for which I’ll be in attendance!) on Thursday vs. the Rangers. Considering what he inherited in the 7th, bases loaded and ONE out, Charlie did OK, giving up a sac-fly and recording a strikeout. Then Stephen pitched a nice 8th getting TWO fly outs and ONE strikeout. 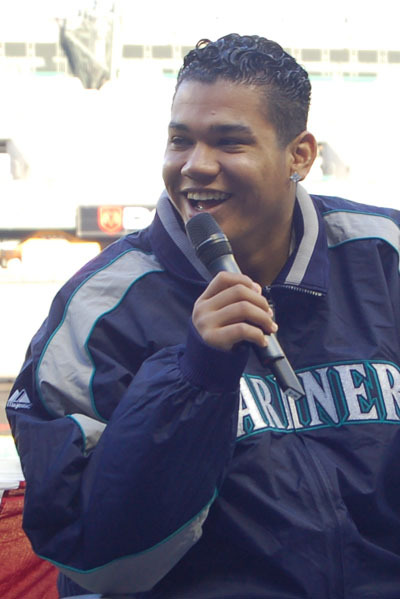 The Mariners fans in the stands with the sign for home run in “Morse Code” were disappointed, as Michael only had a single and a walk. The other Michael (Saunders) hit a TWO-run, pinch hit homer in the 8th to bring the game within ONE run – unfortunately, that would be the last run of the game. Quote of the game . . .